NASA's Cassini mission to Saturn may have came to a fiery end in September, but observations made by the spacecraft in its final months still have plenty to teach us about the mysteries of the ringed planet. Case in point: A new study finds that the electrically charged region of Saturn's atmosphere, known as the ionosphere, is significantly more complex and variable than scientists thought. 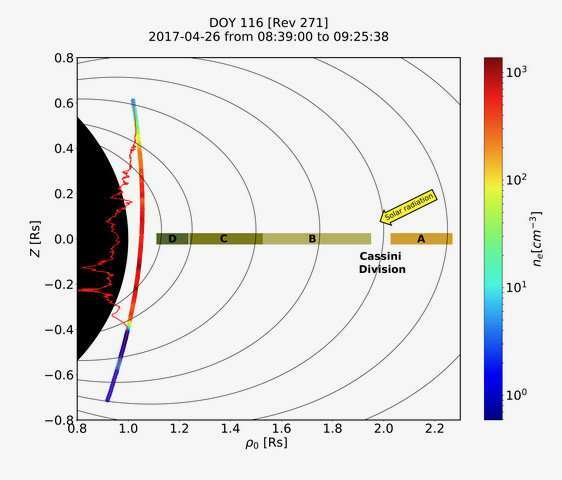 Cassini's instruments also found evidence that the ionosphere is strongly affected by shadows cast by the rings. In addition, it might also interact with microscopic ice particles from the rings themselves in a phenomenon known as "ring rain." "Consider this a prelude of things to come from Cassini," said Hunter Waite, director of planetary mass spectrometry at the South West Research Institute, who was not involved in the study. "Saturn's ionosphere is much more complicated than anyone could imagine." After traveling in the Saturn system for nearly 13 years, Cassini launched on a new trajectory in April that took the two-story-high spacecraft into the previously unexplored territory between Saturn and its rings—including through the top of the planet's atmosphere. This allowed instruments on board the spacecraft to make in-situ observations of Saturn's ionosphere for the first time. Researchers had been able to study this region of Saturn's atmosphere using other methods such as radio occultation, but actually being there allowed them to take much more precise measurements. "There is absolutely no substitute for being in-situ," Waite said. "It changed our whole perspective." The new work is based on data collected by Cassini's Radio and Plasma Wave Science instrument (RPWS), which measures electron density in the planet's atmosphere. William Kurth, the principal investigator for RPWS and a co-author of the study, said the new work is based on Cassini's first 11 passes through the space between the planet and the rings. The spacecraft would eventually make a total of 22. "We thought we had gathered enough information to write a paper about Saturn's ionosphere that would be groundbreaking and set the stage for what would come," he said. For example, the A and B rings cast shadows on the planet that are opaque enough to block the sun's ultraviolet radiation from hitting the atmosphere. Ultraviolet radiation can knock an electron off an atom and allow it to be free floating. Therefore, these shadowy regions have less electron density than other parts of the planet. "We see other types of effects that appear to be relative to the rings, but we don't fully understand them yet," Kurth said. "Further analysis is due on that point." However, they added that it is still possible that the water particles from the rings interact with Saturn's atmosphere at higher latitudes. Kurth said much more about the structure of the ionosphere will become clear in the coming months as data from Cassini's other instruments are published. He said that already, behind the scenes, scientists are beginning to compare observations and work out what they all mean. "We were wrong about the ionosphere, but that's OK," he said. "Mother Nature is always more imaginative than scientists." Since "Mother nature" is a non-entity, the imagination must come from a higher intelligence, one with the ability to create planets and stars, galaxies and organic life as we know it. "Mother Nature is always more imaginative than plasma ignoramuses. " This is precisely what Birkeland found by actual lab experiments, something with which the plasma ignoramuses prefer to ignore.